I have heard that nutritionists recommend you try to eat all colors of the rainbow in your fruits and veggies. That is why I assigned a color of veggie to each meal. I try to get the other colors in with the fruits each day. Thank you so much. I have just began introducing meats this week. My dd is 9 months old. So far, she has loved meat. She must get it from Daddy! I am really enjoying your blog. So far, we seem to be in line with each other on everything. Babywise rocks and you do too!! !THANK YOU! Its nice to have someone out there to bounce baby ideas off of for my sanity’s sake! Question about introducing veggies…Do you still do cereal 3x a day? e.g., at lunch, do I do cereal, then veggie, or just veggie. Today was our first day of veg; I did cereal at breakfast, veggie at lunch, and will do cereal for dinner I guess. Is this right? If so, when do you add the veggie to dinner? After starting the fruit, or should I be doing that already tonight? The books are unclear on this, at least to me…but I’m no genius at this stuff! Thanks so much for your help! That is a good question. First, you can really do what you think is best for your LO. But here is what I did.When there is still just one color of veggie, I still keep 3 cereal feedings in the day. I then add veggie to lunch and dinner. Once two colors (or you could do just two types) of veggies are added, I do two veggies at lunch with no cereal, but still have cereal at breakfast and dinner. Once fruit is introduced, I do cereal and fruit and breakfast, then fruit and veggie for lunch, then cereal, fruit, and veggie for dinner. Some people maintain cereal 3 times a day. Have fun with your introductions! I love to watch babies try new foods. So the pediatrician just told us no more cereal for Cohen because he doesn’t poop on his own while he is eating it. So, now I am confused about what to feed him since I am only just now starting veggies. Any thoughts? In that case, I would do veggies three times a day until you get to fruits. You will likely just need to add more fruits and veggies than kids who eat all three things. Hi- love your website- check it often for my now 6 month old. I just read your post on when they will eat what and love your rainbow color idea. Wanted to know- at what age were they up to this much food during the day? She is eating- 2 cereal feedings, 1 fruit and 1 veggie at this point. I think she is ready for more though. Should I build to this or just start doing it, etc. Thanks! I would just offer as much variety as possible. You can also mix foods. If you do a green veggie and orange veggie each day, then you know you have those two colors done. That leaves you with Red, yellow, blue, purple to try to get in with your fruits. So for breakfast you could do strawberry-bananna and cover red and yellow. Lunch, bannana-grape and cover purple. Then blueberry for dinner. You are then covered! But also remember that nutritionists also say you can think of it on a weekly basis. So you can have a really red day, then a really yellow day, etc. Okay, I just posted another question on the picky eaters blog. Reading this blog about what they eat at each meal has given me another question. In one comment you wrote that before you introduced fruits you gave your kids 2 veggies at lunch, for example – does that mean 2 jars of stage 1 – a total of 4ozs? I’m just wondering if I’m feeding my baby enough because I give her 3T rice cereal mixed with a little yellow veggie at breakfast (just to make it more palatable – after introducing veggies the rice cereal wasn’t quite as exciting), for lunch I nurse her and give her 1 jar (2ozs) of veggies, and do the same for dinner. Should I try to feed her more veggies or add some rice cereal to lunch and dinner until we start fruits? And when I introduce fruits does that mean she gets a jar (2ozs) of veggies and a jar (2ozs) of fruits at dinner??? Sorry to be so dense. I’m a first-timer! 🙂 Want to get SuperBabyFoods bk, but am short on $ this month and every month. 🙂 Thanks! Just noticed the “Solids:What is the Schedule?” blog – argh! I should have scrolled down to bottom before posting anything – sorry! I see that you did veggie, fruit, cereal for dinner – I understand the importance of that order, but since baby prefers something mixed in with cereal, can I mix the fruit/veggie w/ the cereal or do you recommend doing cereal plain? Thank you!!! I’m trying to get the hang of this infant thing and not getting it as easily as I’d like. Definitely having another baby so I can get it right! Ha ha ha! CO Mom,You can definitely do whatever order your baby prefers. Some hate fruit so they need that first, otherwise they won’t eat it. The actual order is not important universally; you just want to find the right order for your baby. I think if the baby will eat other food with cereal, that is great. Before fruits, I did one yellow and one green veggie at lunch. As far as amounts, just feed what is right for her. My son at least 4 times as much as my daughter per meal, and in the end they were always weighing in about the same percentile. Most babies can be trusted to set their own pace. Question for anyone…I have started yellow veggies two days ago along with her cereal at lunch. (she is 6 months). When do I start feeding her veggies 2 times a day? Also, can you do a post on when and what the different stages are in the foods? When do I transition to stage 2? I am also having a hard time getting LO to nurse both sides after solids. I have tried to nurse her one side and then solids and then the other. But she loses interest. So therefore, I have to pump which is a total pain! Any suggestions? Jenny, I started veggies two times a day after I had done yellow veggies for a few days. I would then do one at lunch and one at dinner, both yellow. Once they were in to green veggies, green was at lunch, yellow was at dinner.As far as when to do different stages, that is really different for each child. I did it based on how much they ate. My daughter was never a big eater, so I never moved beyond stage 2 because she couldn’t finish a stage three in a meal. My son was at stage three before 6 months old. BUT that was just the fruit/veggie stage three, not the stage three with chuncks of food. You don’t want to do chunks of food until they are on finger foods and eating them well.I would nurse both sides before solids. Breastmilk is the most important part of her diet still at this age. Thanks for the response…I have another issue that has come up with solids. When I started cereal at 5 months she did great with it. At 6 months she started yellow veggies and did okay for about 3 days. Now…she will not open her mouth for them. She puts those lips as tight as she can and shakes her head and cries without opening her mouth. She now will not eat the cereal. Currently she is on a four hour schedule. I thought that would help so we changed it the other day to four hours. That has not helped either. She is nursing great! She takes both sides. I have tried nursing after giving solids and tried one side before and the other after. I am at a loss…I just don’t understand the change. Since I have introduced all yellow, should I start green today? I have not done fruit yet. I have thought through the possibilities of teething, stomach hurts, and I can’t figure it out. She starts getting whiny when she goes to the highchair. As soon as she gets out…she is happy as a clam. Please provide some insight. By the way, your blog ROCKS! Thanks so much for the life saving support! Jenny,The same thing happened to me with my 6 month old – turned out she had started teething. She stopped eating all solids for 2 1/2 weeks (prior to that she ate EVERYTHING with gusto!) – was a little stressful, but she was nursing just fine. 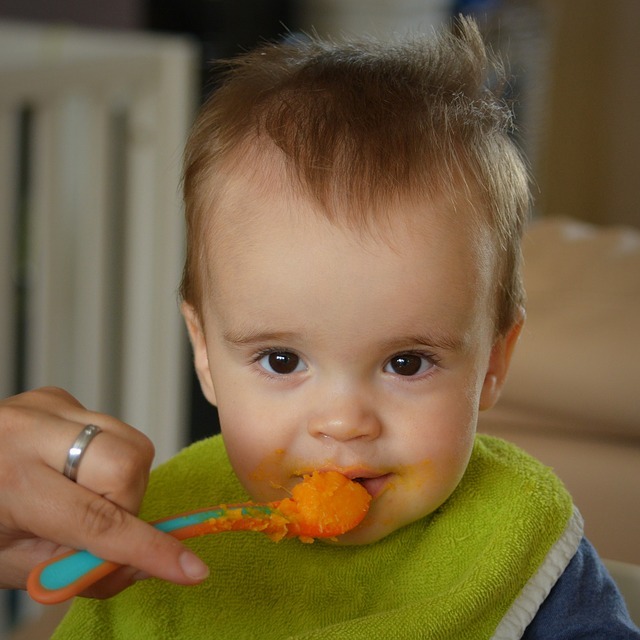 When she first refused the solids, there was no sign of a tooth so I had no idea she had started teething. Once her two lowers broke through, she was fine. The same thing has started to happen again now that she is starting her uppers – no sign of teeth though – just drooling heavily. This time she has just cut down on the amount she is eating and one day she just won’t eat a certain veggie, but the next day she will. Just thought I’d chime in with one possible solution. Hang in there – she’ll get back on track – she’s getting what she needs from nursing. Jenny,I might try green, but she might refuse it right now. Another option is to go straight back to just cereal. You could also try fruit if you want to.CO Mom has a good idea that it could be teething. It could also be that she decided whatever yellow veggie was last introduced is not good. I think I would continue to try to offer it, but not stress about it if she doesn’t want it. Or you could give her a few days off. Think through these different options and go with what you feel is best for her. Good luck! My son is 9 months old this week. We are on a 4 hour schedule, and his current "menu" is:* 6am: 7oz formula, 3T ceral (+ 1 oz. formula), 1/2 tub stage-2 fruit* 10am: 8 oz formula, 1 tub stage-2 veggies, remaining fruit* 2pm: 8 oz formula, 1 container baby yogurt* 6pm: 8 oz formula, 1 jar mixed meat/veggie (though doesn't always finish it)He definitely loves his bottles and often lets out a little whimper when he's done because he'd really like to keep on drinking away. Is there a point, though, where I need to focus on making his bottles smaller? (I should mention that we already had to work to get down to 32 oz. per day — max allowed for formula — from the 40 oz. he was drinking when I was pumping/nursing!) I feel like he's actually getting a lot of solids now, but I guess I'm sort of stuck with this feeling of, okay — we made it to the 4 hour schedule, now what? What do we work toward next?Thanks as always. Parkers, since I breastfeed, I don't think I am a good source when it comes to number of ounces until after 12 months. I would consult perhaps Super Baby Food and also your pediatrition.